Those of us who delve into the world of Law and Attraction are fully aware that our thoughts shape our world, and the power of affirmations. But do you pass this onto your children? I have come across a beautifully illustrated book that is ideal for encouraging your child to develop confidence in themselves and to start their journey into the power of positive thinking. 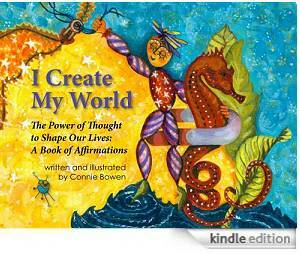 I Create My World by Connie Bowen has a positive affirmation on one page accompanied by whimsical, vivid illustrations on the facing page. As you can see these are all positive statements that your child can identify with. Children pick up on the sayings and actions of adults very quickly so why not introduce your child to positive vibrations and this book will help you make the first step. The paintings were drawn by the the author and they are truly delightful. This is one book that you and your child will want to read over and over. It is available on both Kindle and itunes so it is one that you can take with you. I Create My World is just as valid for adults as for children. Because the statements are powerful and uplifting, and presented in a simple, uncomplicated way I often find myself flipping through the pages.